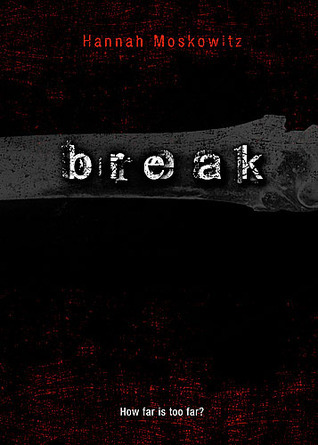 It is always hard to rate a book like Break because using a simple star system just doesn’t seem to go in depth to describe how I felt about it. It is the story of Jonah – a typical teenager, or so would you think – but as a way of dealing with the stresses in his life, he breaks his bones – his hands, his fingers, his ribs and many others. Because he knows that broken bones only come back stronger than they were to begin with. i don’t know if anyone else has noticed, but the whole theme of self-multilation/self-deprivation among teenagers seems to be a re-occurring theme in YA fiction today. Break, Wintergirls (Anorexia), Cutters Don’t Cry (cutting) – it just seems that there are many on the market, and I have to wonder, while these books are good for exposing the issues that some kids face, does it ever influence them to try these different methods…I’ll have to admit, while I never did drugs, in college I took a course called Drug Education one summer, and it could have easily have been re-titled, how to do drugs 101 – it talked about the best ways to get drugs into your system, which ones worked better being injected and snorted and why…so it makes me wonder. Break is a relatively short book (262 pages and the book itself is smaller than a standard mass market) so understandably, it didn’t take me all that long to read. My main issue with it was that I didn’t really see all that much character development – Jonah sounded like he wanted to change and maybe towards the end he started to, but the book just ended…I was kind of left scratching my head trying to figure out what was going on. The cast of secondary characters (his brother Jesse, not-girlfriend Charlotte and cohort Naomi) were other instances of where so much more character development could have gone on.